Gold prices are losing momentum after the People's Bank of China (PBOC) said on Sunday that it would cut the amount of cash that banks must hold as a reserve; this decision attempts to lower financing costs and spur growth in the world's second-biggest economy. This decision drives the demand for Dollar higher on the back of increased uncertainty which puts Gold under pressure. Gold prices began to fall during the early Asian session after breaking below the $1200 level. 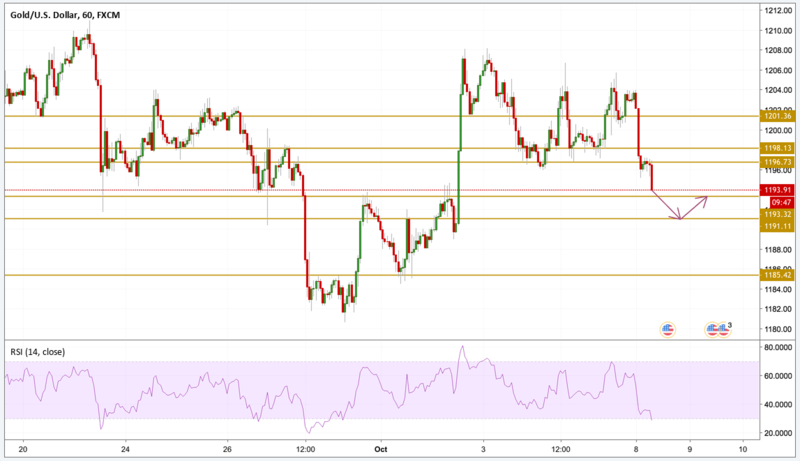 The price is currently just below the $1194 level with more room to go as the RSI points towards early oversold conditions and the next level to watch is the $1191.10 support level before we can see a potential pullback.